The university has a standing requirement that mid-term grades be entered into ASAP for ALL undergraduate students (including Freshmen). It also requires that final grades be entered into ASAP for ALL undergraduates and graduate students. All faculty are required to keep their gradebook in Blackboard Learn that has the capability of automatically transferring ALL passing grades to ASAP. During the 6th week of class and the beginning of final exams, you will receive a notification from Office of Vice Provost stating midterm or final grades can be entered into ASAP. If you manage grades in Excel and upload to Blackboard Learn, click here to follow the steps look here: http://www.hartloan.com/if-you-need-online-cash-advance-now.html. Locate the column that has midterm or final grades. Use the drop-down menu of the column title and choose Edit Column Information. Change the Column Name ASAPMidterm for midterm grades and ASAPFinal for final grades (Leave Grade Center Name blank). ONLY when you have letter grades finalized and are ready to transfer grades to ASAP, set the grade column as an External Grade Column. 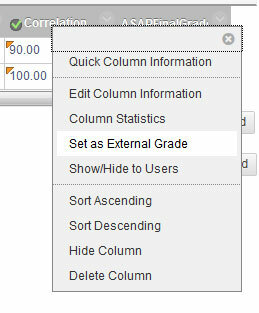 To do so, click drop-down menu of the column title and choose Set as External Grade. “F” and “I” grades do not automatically transfer from Blackboard Learn to ASAP. Enter them manually in ASAP. Create a column to designate it as midterm or final grade column. Enter ASAPMidterm for midterm grades and ASAPFinal for final grades as the Column Name (Leave Grade Center Name blank). Set Primary Display to ‘Text’ and Secondary Display to ‘None’, and Points Possible to 0. Click Submit and enter your grades in the ASAPMidterm or ASAPFinal column. 1. If you wish to enter grades manually in ASAP, you are welcome to do so (when ASAP is open for recording grades). 2. If grades exist in ASAP, grades transfer process does not overwrite grades in ASAP. 3. Check ASAP at 8 am after the day you set the column as External Grade in Blackboard Learn.